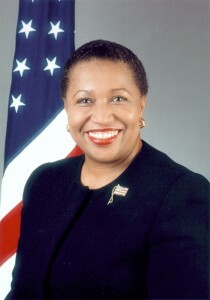 During her tenure as U.S. ambassador to New Zealand, Carol Moseley Braun saw firsthand the impact a female head of state could make. Last February, she followed Helen Clark’s example by adding her name to the list of candidates seeking to challenge George W. Bush for the US presidency. Ms Moseley Braun, 56, faces a crowded field, with eight other candidates already seeking the Democratic Party’s presidential nomination and at least two others mulling a run. Starting with the Iowa caucuses on Jan. 19, the candidates will face each other in a series of state-by-state primaries, with the winner facing Bush in November 2004. The former ambassador must confront an uphill battle, as she currently trails most of her competitors in the polls and ranked eighth of the nine in campaign fundraising, according to Federal Election Commission reports filed in July. However, she has come from behind before. In 1992, Ms Moseley Braun ran for the Senate as an underdog, defeated popular incumbent Alan Dixon in the primary and eventually won the seat in the general election. In doing so, she became the first and only black woman elected to the Senate. Now, Ms Moseley Braun becomes the first black woman to seek a major party’s nomination since Shirley Chisholm in 1972. On Aug. 26, she helped her cause by receiving the endorsement of the National Organization for Women and the National Women’s Political Caucus, two influential equal-rights organizations. Ms Moseley Braun brings another important difference to the Democratic field. After she lost her Senate reelection bid in 1998, then-President Bill Clinton appointed her ambassador to New Zealand, as well as Samoa, the Cook Islands and Antarctica. Throughout her campaign, Ms Moseley Braun has cited that role as giving her an advantage on foreign policy, as she is the only former diplomat in the race. Ms Moseley Braun, conversely, has made international relations a central focus of her platform, consistently criticizing the Bush administration for the preemptive war in Iraq and the image of America it projects to the rest of the world. Ms Moseley Braun believes the lack of support for the war at home provides a chance for the next president to reverse the “Bush doctrine” of preemption and repair international relations damaged by the conflict. The former ambassador praised the New Zealand government for the role it has played in working for global peace. She also believes the country’s anti-nuclear policies “should not foreclose our willingness to work with New Zealand” on law enforcement and security issues. Before she was approached about the ambassador job, Ms Moseley Braun said she knew little about New Zealand. But she learned as much as she could before heading to Wellington in December 1999. Part of that tutoring included visits to Ruatepupuke 2, one of the few Marae outside New Zealand, which is housed at the Field Museum. As ambassador, Moseley Braun hired the first Maori at the U.S. Embassy. She said she learned a great deal during her tenure by traveling throughout both the north and south islands, in addition to the other territories in her diplomatic portfolio. “I was inspired by the extent to which New Zealand has embraced alternative technologies and energy technology development,” she said, citing wind power and co-generation as examples. The former ambassador also praised New Zealand for a climate in which women can effectively seek and win high-elected office. “The development of consensus around the participation of women in [Kiwi] civil society has always historically preceded the development of that consensus here, unfortunately,” Ms Moseley Braun said. Both professionally and personally, Ms Moseley Braun reflects fondly on her time in New Zealand. She said moments such as welcoming the new millennium in the world’s first time zone and becoming an honorary member of the Te Atiawa tribe influenced her life well beyond the political realm. Now she hopes those two years of experience can help her achieve four years in the White House.